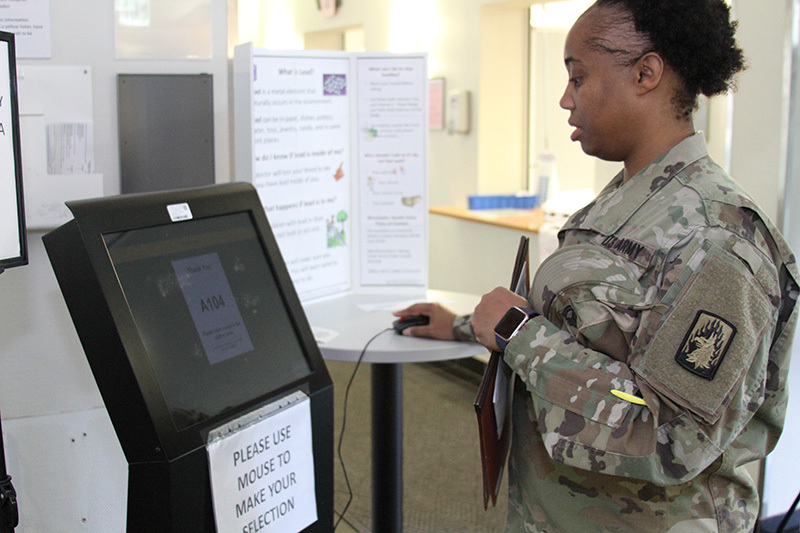 SEMBACH, Germany — Army military treatment facilities across Europe will soon see a change in the way behavioral health screenings are completed at primary care appointments. The Behavioral Health Data Portal is an enterprise-wide web-application that enables standardized data collection for improved screenings in primary care settings. Currently, behavioral health (BH) screenings are completed with a short paper survey. Once clinics begin using the BHDP, patients will complete an electronic survey. According to Lt. Col. Emile Wijnans, Regional Health Command Europe Director of Psychological Health, research has shown that the BHDP electronic screening can identify two times as many symptomatic patients as the current paper version. “Implementing this system in the primary care clinics will help us to better identify patients who could benefit from behavioral health care, whose symptoms otherwise may not have been seen,” Wijnans said. According to U.S. Army Medical Command, 67 percent of people with a behavioral health disorder do not get BH treatment. However, 80 percent of people with a behavioral health disorder will visit primary care at least once in a calendar year. Marsha Graham, RHCE Regional Nurse Case Manager, said the goal is to identify those patients who could use additional BH care with the BHDP screening in primary care. Currently, patients could be asked to complete a BH survey at every primary care visit. With BHDP, screenings will drop to quarterly. Additionally, use of the BHDP allows for consolidation of data from multiple sources into one centralized system — reducing redundancy for patients, streamlining the screening process and potentially helping to identify other areas of concern the provider would not have been aware of. Maj. Alfonso Alvarez, RHCE Deputy Director of Psychological Health, said that the new screening also helps the primary care teams to better utilize the internal behavioral health consultants integrated in those clinics. IBHCs are trained to assist primary care managers in addressing a wide variety of medical and psychological concerns that could improve with additional treatment. When BHDP is implemented, if a patient needs to complete a BH survey, after checking in at the primary care clinic they will be directed to a kiosk with directions for logging into the computer. Once the survey is completed, the patient will log out of the system and take a seat in the waiting room. The survey answers are automatically transferred to the provider. Army clinics in the U.S. Army Medical Department Activity Bavaria footprint will see the change beginning in February, while clinics that fall under Landstuhl Regional Medical Center will see the change in the coming months.